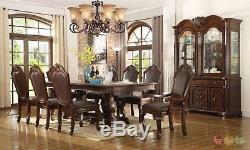 Chateau Formal Dining Room Set. This gorgeous formal dining set will give your dining room an elegant and distinguished look. The rectangular table top has two 15 inch leaves which allow you to expand the top from 66 to 96 inches long. The top has smooth rounded corners and an intricately carved trim around the edge. The double pedestal base is adorned with more detailed carvings creating a rich appearance in a warm medium cherry finish. The arm chairs have softly scrolling arms with the same scroll detail repeated at the crown on the high chair backs. Cabriole legs on all the chairs are a lovely touch. Bonded leather upholstery on the seats and backs provides a comfortable and stylish element. Nail head trim surrounding the front and back of each chair adds to the traditional design. Accentuate your dining room with the sophisticated designs of the beautiful matching buffet and hutch. Ash burl veneers are complemented with intricate carved detail and stunning hardware with an antique appeal. The double arch top, carved crown, fluted columns and bracket feet add to the traditional style of this magnificent piece. Two glass door with two shelves provide perfect space to showcase your best china. The buffet offers six drawers and two more doors, offering storage for dining room table settings and accessories. 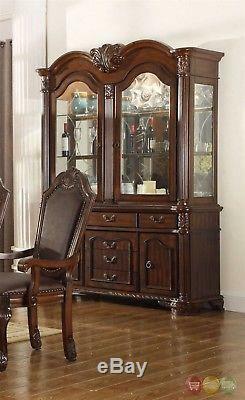 Add height, dimension, and exceptional designs to your dining room with this china cabinet. The Chateau collection will help you create a complete formal dining room ensemble with an elegant traditional style. The collection includes a dining table, dining side chair, dining arm chair, and china cabinet. The pieces feature exquisite attention to detail. Carved acanthus leaves, fluted columns, soft scrolls, and intricate trims are gorgeous in the warm medium cherry wood finish. Antique style metal bail handles and ring pulls on drawer fronts are a nice finishing touch. This dining collection will blend well with any traditional style home, to create the sophisticated and distinguished formal dining space you have always wanted. This Listing includes the table, 4 side chairs and 2 arm chairs. Additional side chairs and china cabinet are also available, but not included in this listing. Double Pedestal Table with two 15 Inch Leaves. Arm Chair with Detailed Legs and Upholstered Seat and Seat Back. Side Chair with Detailed Legs and Upholstered Seat and Seat Back. Ash burl veneers in a deep brown finish. Stunning hardware with an antique appeal. Detailed edges with crafted detail and elegant cabriole legs. Smooth ash burl veneer tops. Constructed from ash burl veneers. Item & Dimensions For Buffet & Hutch (Not Included). Two Glass Doors with Two Shelves, Six Drawers, Two Ash Veneers Doors. We will do anything within reason to favorably resolve any issues. We strive to be a 5 star company, and we are committed to providing outstanding customer service in order to earn 5 stars in all categories. Every effort is made to provide high quality, accurate images to assist you in selecting your furniture. However, images may vary in color depending on a number of factors including but not limited to individual computer monitor color settings, photography, lighting and natural variations. Please note: ShopFactoryDirect is not responsible for color variations or measurements that are slightly off (three inches or less). Please keep in mind that photography, computer monitor settings, wood staining process and fabric dye-lots on each individual piece may cause slight color variations. Therefore the item you receive may not be an exact match to what you see on your computer screen. The team at Shop Factory Direct is committed to providing you with outstanding customer service. Please note: some addresses in very remote, rural areas mountains, very narrow or unpaved roads, etc. Or urban roads with limited access excessive tolls/high traffic/one-way streets, etc. White glove also includes removal of discarded packaging materials if requested. Please allow up to 2 weeks for your order to be delivered. Although we do our best to get your order to you as quickly as possible. Unexpected delays are sometimes unavoidable, so please be patient. If the packing slip indicates a different box count than what is delivered, make sure you. Minor damages will be restored to first quality by a professional furniture restoration technician. If restoration costs are estimated to exceed replacement costs, the damaged item(s) will be replaced. Any items determined to be defective will also be restored to first quality or replaced at no cost to the purchaser. If you have any questions or concerns please feel free to message or call. Our staff is happy to assist you in any way possible. Our office is open Monday through Friday from. Sales staff may be available to answer questions over the weekend. The item "Chateau Traditional 7 Piece Formal Dining Room Set Pedestal Table & Chairs" is in sale since Wednesday, July 25, 2012. This item is in the category "Home & Garden\Furniture\Dining Sets". The seller is "shopfactorydirect" and is located in Chino, California. This item can be shipped to United States.